Posted 2:01 pm by justin & filed under Gig. Anyway just to update on the last two fantastic gigs we did this summer. 4 People not profit had there club debut, teaming up with 4th Bass to host a night on the top floor of the Middlesbrough Empire on the 17th of June. 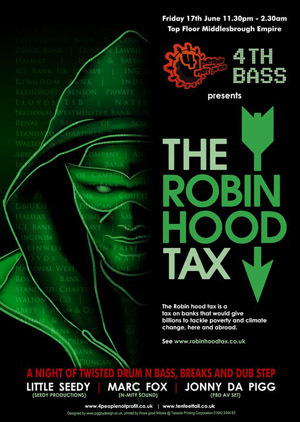 We aimed to raise awareness and support for the Robin hood tax campaign and gave out over a 100 Robin hood eye masks with flyers about the campaign and badges to an enthusiastic and interested crowd at the Empire. DJ’ s Marc Fox and Seedy laid down some fat drum n bass, breaks and dub step that got the empire rocking!!! 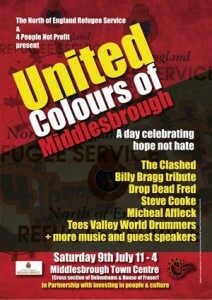 Following this we teamed up with the North of England refugee service on the 9th July to present an outdoor gig in Middlesbrough town centre ‘United Colours of Middlesbrough’. The gig was in response to the EDL doing a rally in Middlesbrough and aimed in contrast to there message show that Middlesbrough was a town which celebrated diversity and multiculturalism. The show was a great success drawing a large crowd throughout the day to enjoy such acts as Drop Dead Fred, Steve Cooke, Bragging it, Micheal Affleck and the storming closing Clash tribute band The Clashed!! Also appearing were various speakers from Middlesbrough council, local unions and the refugee service highlighting the importance of unity against ignorance and to be proud of Middlesbrough’s diversity!! The next gig is planned for December the 3rd at the Spa hotel in Saltburn, watch this space for more details….